Fort Campbell is an Army post located on approximately 105,000 acres in Montgomery and Stewart counties, Tennessee, and Trigg and Christian counties, Kentucky. Fort Campbell is 14 miles south of Hopkinsville, Kentucky, and 13 miles north of Clarksville, Tennessee. The closest major urban area (greater than 500,000 residents) to the installation is Nashville, Tennessee, located 60 miles to the southeast. Louisville, Kentucky; Memphis, Tennessee; and St. Louis, Missouri are within 200 miles of the installation. Approximately 70,000 acres, or two thirds of the total area of the installation, is in Tennessee; however, the official postal address for Fort Campbell is Kentucky. About 86 percent of the post is undeveloped and maintained to provide a realistic context for training activities. The maneuver space of Fort Campbell consists of approximately 93,000 acres that includes 27,000 acres of ranges and impact areas and 65,000 acres of light maneuver areas. Access to impact and demolition areas is restricted due to hazards associated with training and unexploded ordnance. Except for roads, cleared areas, and structures associated with training and support facilities, most of the rear training areas consist of natural habitat including forests, old fields, fields leased for agriculture, streams, lakes, and wetlands. The topography at Fort Campbell is gently rolling, with the exception of a comparatively flat area along the eastern boundary, and approximately 5,000 acres of steep, highly dissected, hilly land along the western boundary. These areas have relatively high topographical relief (50 to 120 feet). Fort Campbell supports approximately 700 watercourses, totaling about 453 stream miles within nine subwatersheds of the Cumberland River. Four man-made lakes lie within the installation boundaries and are used for recreational and training purposes; Lake Kyle is a 81-acre lake located in a Training Area 31 and is often used for training activities, Lake Taal is a 25.2-acre lake located in the southern portion of the cantonment area, Joe Swing Pool is an abandoned 6-acre quarry located near the golf course, and an unnamed, 4-acre lake exists in Training Area 8-A. 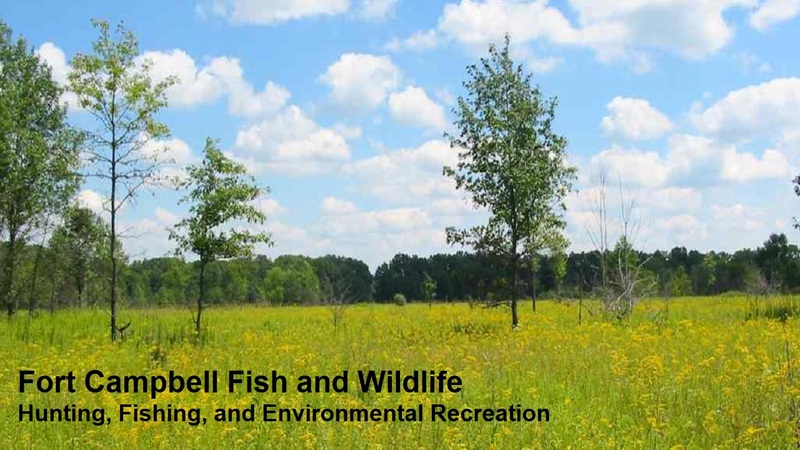 Terrestrial habitat on Fort Campbell consists of a mixture of forest and native prairies. Woodlands currently occupy about 46 percent of the installation’s total area. The forests consist primarily of deciduous (hardwood) communities, although pine plantations are predominant in the southwest part of the installation. Approximately 13,000 acres are classified as grasslands but vary greatly in the amount of woody succession due to location or limitations to prescribed fire and mechanical treatments. Agricultural leases support hay, wheat, corn, grain sorghum, and soybeans production on approximately 6,000 acres. The rear area of Fort Campbell offers more than 66,000 acres for hunting. Small game species include coyote, crow, dove, frog, quail, rabbit, raccoon, squirrel, waterfowl, and woodcock. White-tailed deer and turkey are large game species hunted on Fort Campbell. Fishing for both cold water and warm water species is permitted year-round on Fort Campbell. The installation has approximately 40 miles of stream suitable for fishing during a portion of the year and 19 miles are suitable for stocking trout. Non consumptive uses such as hiking, boating, camping, horseback riding, and bird watching are seasonally available. Operation of off road vehicles for recreational purposes in the rear area is not permitted on Fort Campbell. An annual recreational permit is available for each activity. Use of cameras and video recorders are prohibited unless approved through the Fort Campbell Public Affairs Office. All individuals participating in hunting and fishing activities are required to have the appropriate Tennessee or Kentucky hunting and fishing licenses, a completed state hunter education course, and a valid Fort Campbell recreational permit. Permits for hunting, fishing, and outdoor recreational activities and associated area assignments are issued by the Fish and Wildlife Program. No hunting is allowed on Tuesdays or Wednesdays unless otherwise scheduled. Conservation law enforcement is provided through an MOA with the US Fish and Wildlife Service. USFWS officers enforce Federal and State laws protecting natural and cultural resources on Fort Campbell. Violators of Federal and State game and natural resource laws are subject to prosecution before a U.S. Magistrate. Violators are subject to suspension or revocation of hunting, fishing, and other outdoor recreation activities privileges. In addition, violations may involve criminal punishment and/or punishment under the Uniform Code of Military Justice. Certain offenses may also result in permanent barring from Fort Campbell.